It all started with an email from my husband this morning. We both are avid Amazon.com fans and respectively have wish lists set up on the site. I present to you specimen A: For the sake of keeping the integrity of the conversation, I will display it exactly as it happened. B: The reviews on this wolf t-shirt are funny: “Pros: Fits my girthy frame, has wolves on it, attracts women. Cons: Only 3 wolves (could probably use a few more on the 'guns'), cannot see wolves when sitting with arms crossed, wolves would have been better if they glowed in the dark.” LOL. Me: What the??? What is this?? Me: OHHHH ok I hadn’t gotten this far down on my email list yet. Ha Ha so funny. This looks like something napoleon dynamite would wear. B: Here's another Gem. “Continuing with my work day, I counseled many clients. What a difference a shirt makes. Its powers extended to them and cured many many problems. 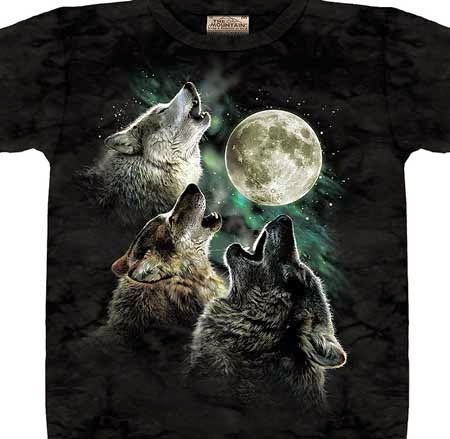 Depression: go buy a 3 wolf moon shirt, Anxiety: let the wolves protect you and keep you safe, Ego-dystonic Lesbianism: find a man with said shirt, Schizophrenia: Only do what the wolves say, ignore all other voices. I could go on forever.” Hahahahaha, I LOL’d for real on this one. B: Nice, you want to get some for when we go see New Moon? We can both wear them! Me: LOL… I actually thought of that. This whole conversation is thoroughly amusing. Me: I just checked your wishlist- Why do you want a Velcro rubber tourniquet? B: It’s a part of my survival gear, in case a bear bites off my leg, BOOM, tourniquet. That was the end of our email discussion, but really you should check out some of the reviews on this piece- cheap entertainment for hours! A. I'm so hip to buying that shirt (I'm with the werewolves, you know). B. You have just turned me on to a new obsession: Item reviews on online shopping sites. C. You guys are funny. Honestly, I think that velcro tourniquet "emergency pack" idea is brilliant. okay, seriously...you two...so funny! so, secretly, brandon is counting down the days until New Moon?!?!? I knew he was a true fan!! Ha ha... thanks ladies... I wonder what other Gems are out there just waiting to be discovered. Cristy- if you like the tourniquet, you should see the rest of his wish list- some of the highlights: machete, 1400 calorie emergency food ration packs, and the magical mountain men's three wolf moon shirt. Jess- Yeah Brandon wants to see it, even though he's not as into is as us, but I think he just wants a opportunity to sport the shirt. Des- I can't believe some of the stuff people out there write!